Fast trails and a good-time vibe left athletes smiling as they pulled in from a pedal-heavy Giant Toa Enduro at Crankworx Rotorua, and the whip cranked the crowd into a frenzy to cap the night. Coming into the enduro, Giant rider Josh Carlson was running strong, however, New Zealand’s Matt Walker proved the unexpected victor late, sealing the deal on the final stage, after placing eighth the year before and following fellow Kiwi, Carl Jones, in the cumulative standings for much of the race. 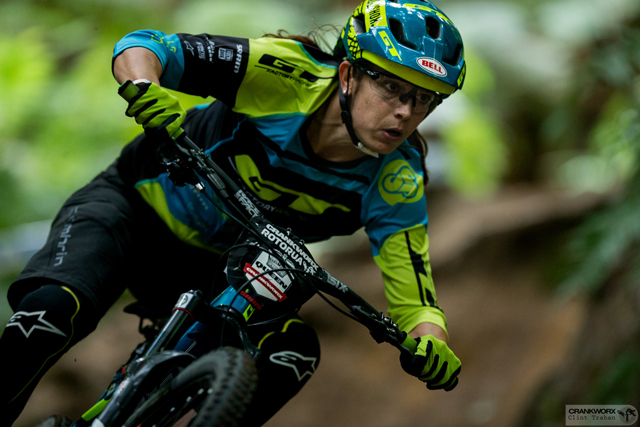 Sharing the limelight, 2015 Queen of Crankworx Anneke Beerten, proved her mettle, charging in to win with royal confidence. Beerten admitted she is thrilled to have the monkey off her back, so to speak, with a win worthy of her 2015 success right out of the gate. She even dubbed the rough, off-camber trail of K2 easy, saying it was relaxing as it was short, making it less physically taxing for her, though its twists and turns bucked seasoned Kiwis Carl Jones and Brooke MacDonald right off. Overall, the day left her challenged, but happy and she definitely took a shine to finish at Skyline Gravity Park. Now an Enduro World Series qualifier, the race attracted a tenacious crowd of New Zealand riders who filled the ranks of the top five nicely with Eddie Masters, second, Sam Blenkinsop, third, and Carl Jones, fifth in the men’s field. Beerten was the sole international rider in the women’s top five.